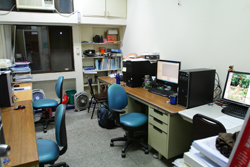 The EMC Lab was established with Prof. Tzong-Lin, Wu in 2005, and is now located in the EE2 Building, one of the four buildings belonging to the department of electrical engineering, National Taiwan University. In our EMC group, there are seven Ph. D students and also seven M.S students. They are seated in three different labs, room 522, 527, and 533. Four of the Ph. 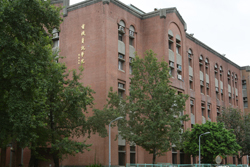 D students are seated in room 522, and four M.S students of the first year are all contained in room 527, with the M.S students belonging to other professors. The other students of our group are contained in room 533, with other graduate students belonging to Prof. Ruey-Beei, Wu. 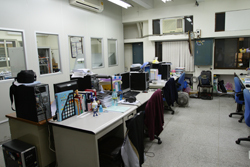 And the office of Prof. Tzong-Lin, Wu is located in room 547. In EE2 Building room 522, there are four Ph. D Students. Their current research includes signal integrity (SI), power integrity (PI), and microwave passive components. EE2 Building room 533, named Electromagnetic Design For Advanced Packaging Lab, contains both students of Prof. Ruey-Beei, Wu and Prof. Tzong-Lin, Wu. There are a total of 12 seats for graduate students. Their research includes signal integrity (SI), power integrity (PI), and electromagnetic compatibility (EMC). Most of the apparatus owned by our group are also located in room 533, such as TDR and GTEM. The Tektronix Time-domain Reflectometry (TDR) is for signal integrity measurement. Voltage and impedance waveform of TDR and TDT can be measured accurately with two 9 ns rise time signal source modules. Besides, eye diagram measuring can help analyzing quality in SI issue. The GTEM chamber, which can establish turn-key measurement solution for electromagnetic interference (EMI) and susceptibility (EMS). This system include a spectrum analyzer (R&S FSP40) covering from 800MHz to 40GHz, 20W power amplifier (AR 20ST) covering from 800MHz to 18GHz, arbitrary waveform generator (Tektronix AWG7122B) up to 12GS/s, and other accessories such as power meter, preamplifier, calibration probes, and cables. 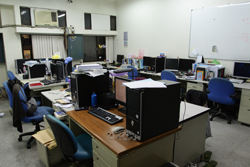 These facilities provide an excellent environment for the electromagnetic design and integration research of advanced package and system on package (SoP).